Villa D'Este is one of the few classic Perth restaurants which has stood the test of time, renowned for its fabulous offerings from its rotisserie and volcanic rock oven. 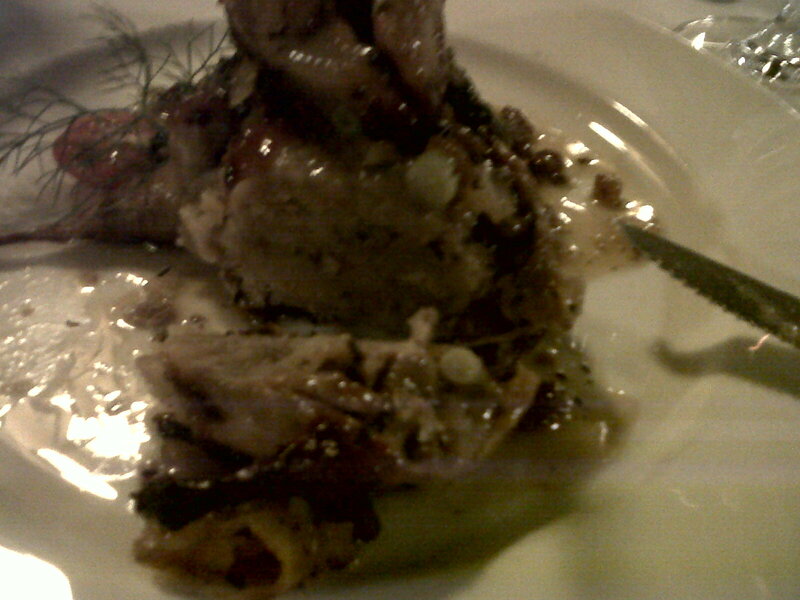 Service and food quality remains consistently high - check out my post from last month: 3 September 2010 - Suckling Pig at Villa D'Este. I catch up with Geezer and Greg for a quiet weeknight dinner. I swear Geezer seems to eat here most of the week, now that he's living in the vicinity! The weather is feeling mild-ish, so we get a table outside on the terrace. Michael the Sommelier has recommended the Max V from Robertson of Clare. 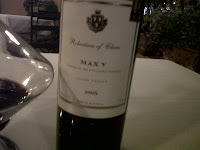 This wine is a deep, brooding, almost black colour, with spiced dark berries on the nose, teasing at what is to come. It's made from the 5 noble grape varieties - Cabernet Sauvignon, Merlot, Cabernet Franc, Malbec and Petit Verdot - in a Bordeaux style blend. The first mouthful tells you in no uncertain terms that this wine will cellar well for many more years. It's very dense and tightly wound with tannins, but you can taste the flavour starting to come through. There's even a delightful spicy burn down your throat as you swallow it. Geezer reckons it'll open up, and he's right. Over the course of the night, the wine starts to open up more, and unveils its spicy berry flavours - cinnamon, nutmeg, blackberries, blueberries. There's even a sweetness at the front. Great drop - certainly give it a try! Alright - onto the food! I usually order the snails, swimming in a delightful sauce of melted butter and sauteed garlic. 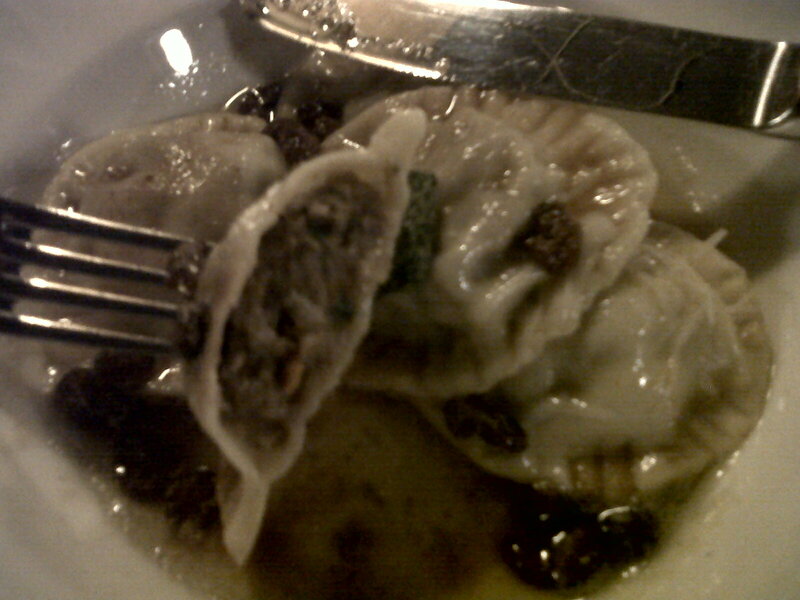 But tonight, a special catches my eye - little parcels of agnolotti pasta with venison filling, also swimming in a butter sauce - how could I refuse! Geezer and Greg follow suit. This thing is so wrong on many levels (minced bambi for one, and the fact that you're slathering it in sauce made from a respectably-sized slab of butter, for another), but it was delicious. The pasta was tender and giving, the venison filling juicy, and the butter sauce nearly gone. I'm glad we didn't order any bread, because I would have used it to soak up the remainder of the butter, which cannot be good for anybody's arteries. 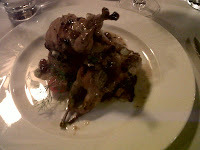 For the main, I order an old stalwart of the Villa D'Este menu - Quaglie con uva. 2 little quails stuffed with grapes and grilled with a cherry glaze. The quails are boneless except for the legs, and you are given a handy saucer of water with a slice of lemon, so that you can use your hands. Finger-licking good, like the Colonel never imagined. Greg orders the suckling pig from the rotisserie - all good, as reported in my 3 September post. We finished up with an espresso, which unfortunately was the only downside to the meal. Given all the great coffee I've been enjoying lately from Tartine, and from Miss Silvia, the espresso I received didn't have much of a crema, and tasted weak (not enough grounds maybe?) and slightly over-extracted (too much water?). But after such a delightful meal like that, I can't complain. $100 a head excluding wines, and well worth it! And so we go on our merry way to Geezer's place around the corner to enjoy an after-dinner cigar (more on this in a separate post!). 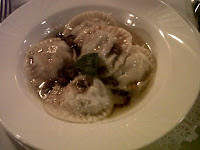 Agree, Villa D'Este consistently delivers high quality food and service time and time again. My favourites here are the beef carpaccio, osso bucco special and the crepes suzette.